A year ago, we were still cleaning up our yards after Hurricane Irma. We were pulling down plywood and propping up fences. And we were eagerly awaiting the opening rounds of debris collection by village crews. This week marks a year since the storm skimmed past Palm Beach County, making landfall first in the Keys and then on Florida’s Gulf Coast. We were spared the worst of Irma’s wrath — but that doesn’t mean there weren’t lessons to be learned from the storm. 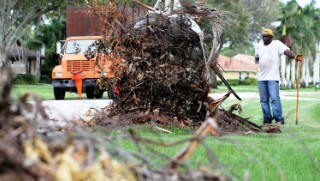 In Wellington, many of those lessons centered on debris removal. The village faced the herculean task of collecting and disposing of about 180,000 cubic yards of vegetative debris, a two-monthlong cleanup with a nearly $3.5 million price tag. The biggest lesson learned by Wellington: Get paperwork and authorization for debris removal from gated communities before even the hint of a storm, Village Manager Paul Schofield said. “Absent those approvals, we cannot go into gated communities to get debris,” he said. This year, the village coordinated with the Federal Emergency Management Agency to have gated communities and homeowners associations sign an essential form, a right-of-entry agreement, before hurricane season began. Having that in advance gives Wellington breathing room after a storm so officials aren’t chasing down board members, Schofield said. Alvin Rushin of Georgia helps clean up Hurricane Irma debris on Fallview Way in Wellington on Sept. 27, 2017. Another lesson learned: The village now will check in with its debris-removal contractors in the days before a storm hits to make sure those contracts can be fulfilled. When Irma scraped across Florida, it caused damage in all 67 counties and created a massive demand for debris-cleanup crews. That, plus the existing demand in the Gulf states from the devastation created by Hurricane Harvey, put Wellington in a pickle in the days after Irma, Schofield said. “There just weren’t enough debris contractors to go around,” he said. Wellington also changed the way it monitors the debris it collects. Instead of using a cumbersome paper-ticketing system, the Village Council in May approved a contract to bring in a service that electronically keeps track of how much debris is collected. That change was key not only to creating a more efficient cleanup process but also to getting money back from FEMA, Schofield said. “If you don’t have really great documentation, they will not reimburse you,” he said. The storm also managed to bring neighbors together online in a new way. Bob Markey, a longtime western communities resident and Realtor whose family once owned and ran the weekly Town-Crier newspaper, started two Facebook groups a couple of years ago to help people stay in touch following a hurricane. Those groups, Wellington Florida Speaks and Royal Palm Beach Speaks, proved key to staying connected and up-to-date throughout Hurricane Irma. Residents used the groups to share information about storm prep, supply availability and damage. “There is nothing like a hurricane to bring back that sense of community which many of us have lost in this era of political civil war,” Markey said. His groups, which combined have 5,000 members, allow people to instantly share information. “Social media and our groups have truly enabled citizen journalism to take off,” he said.